Typically once your treatment is complete and braces are removed, you will be given a set of retainers to wear. Retainers are utilized to hold your teeth in their new positions until your bone, gums, and muscles adapt to the new teeth positions. They are very important in the long-term maintenance of your tooth alignment. You must wear your retainer as instructed, otherwise your teeth may move and become crooked, and the corrections achieved during your orthodontic treatment will be lost. Dr. Chen believes in wearing retainers for as long as you want to keep your teeth straight! In fact, Dr. Chen himself still wears his every night (he had braces when he was 13 years old)! Everyone’s body and teeth goes thru changes as we get older, so let’s hold them in place with retainers! The Essix retainer has become more popular recently because of its ability to hold teeth in place well, and patients find them more aesthetic and comfortable to wear. It is made of a clear durable plastic and slides into place over your teeth. The Essix retainer is typically worn 8 to 10 hours per day and is usually worn while sleeping. To ensure the longest possible life of your Essix retainer, please brush the plastic after wearing it with mild soap and water only. Do not use toothpaste or harsh cleaning materials. Keep your retainer away from heat sources including such things as: car dashboards, boiling water, microwave ovens, washing machines, and the clothes dryer. Because your Essix retainer is small and clear, it is easy to lose. Store the Essix retainer in the retainer case provided and place it in a safe location when it is not in use. If you should ever have a problem with your retainer, or if it is lost or distorted, please call our office right away – Orthodontics: Patrick P Chen, DDS, PA Phone Number 972-312-0570! 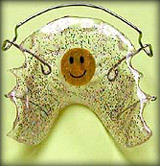 The Hawley retainer has a metal wire that surrounds the teeth and keeps them in place. It is made of clear pink acrylic plastic and uses stainless steel clasps to cover the back molar teeth. A long thin metal bow is also used to span across the front incisors from the right canine to the left canine.